AKC Giant Schnauzer conformation show breeder located in Garden City, MO. Which is about an hour south of Kansas City. We welcome those interested in adopting one of our puppies to come visit our 86 acre family farm to see and discuss the breed and play with the puppies. If you are not local, we can ship your puppy to you if needed. Look on PAYMENTS page and BLOG to read about shipping. We have puppies with cropped and natural ears and can look into getting the ears cropped on any natural eared puppy if you want that. Please look over our site and call, email, or text if you have any questions you can’t find the answer to on our site. I have been breeding for over 20 years, work my dogs in conformation classes, and am a mother of 5 children, so lead a very busy life, but always have time to discuss our dogs and puppies. If you plan on getting a puppy from us please read over ALL pages and links on this website. 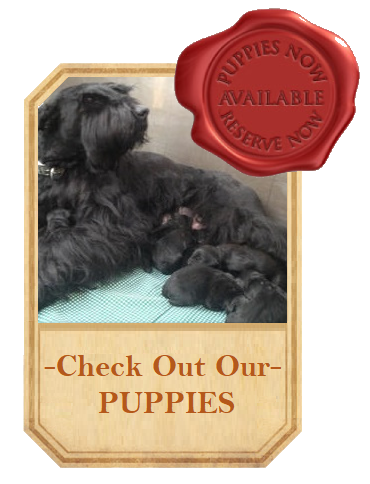 It is a wealth of information on the Giant Schnauzer breed, even if you do not get a pup from us. It has taken years of pain staking searching and breeding to achieve the look and disposition I want in this breed. The Giant Schnauzer is a wonderful companion dog. He is energetic, robust, and when properly socialized, a wonderful family pet as well as public working dog. The preservation of his heritage, however, should include the maintenance of those functions for which he was developed, so give your schnauzer proper training and a job to do. Our adult Giants we breed are large and more muscular and have the drive of the working Schnauzer but also do well in conformation. I feel an obligation to the first breeders that put the work and time into creating this breed, to stick with what they first intended for the breed. They are great in conformation as well as schutzhund, obedience, tracking, search and rescue, etc… and with proper training and socializing are very diverse on what they can achieve. Many of our past pups have went on to become mobility service dogs and therapy service dogs. They are also wonderful in law enforcement and protection. The coats we strive for is a mix of both the hard and soft, so has a thicker texture for those nice full leg pillars that do well in conformation classes but still has enough hard hairs to be a field dog as the breed was first intended. We do not breed our females every year so may only have 3 or 4 litters a year so it is best to get on our deposit wait list asap if you want a future puppy. We do not breed to make a quick buck, but are trying to improve the breed, therefor all our puppies go with their AKC limited puppy papers unless I have approved the new owner for full papers. This is so people don’t just willy nilly breed their dog just because it has full papers. I am always available to speak to you either by call, text, or email 24/7 in case of an emergency, but please only Call or Text during daytime, (9am to 9pm CST), if you are wanting to just talk. I keep my phone next to me at night for any puppy emergencies and a text or call in the middle of the night or to early in the morning will wake me. I am here for my puppy buyers throughout the dog’s life and hope you keep in touch with updates as your puppy grows and maybe even gets titled. You can see health test results, pedigree, and photos of each of my current breeding adults on the SIRES / DAMS page. If you are interested in future litter info you are welcome to contact me to see who is bred or will be bred soon. Is it the right breed for you? Please read the BLOG page and the section that answers that question. Many questions can be answered by reading the PUPPY CARE page, BLOG page, and other pages of our website. You are welcome to call to discuss your situation and get my opinion anytime.